The bathrobe exemplifies how much cotton is used in our clothes. The African smallholder farmers who sustainably grow the raw material for millions of textiles are usually just as rarely present in the public eye as bathrobes are – outside of a wellness holiday. That’s something that the Hamburg-based initiative CmiA, which campaigns for sustainably produced cotton in Africa, aims to change with the support of prominent ambassadors, influencers, textile companies and non-governmental organizations. 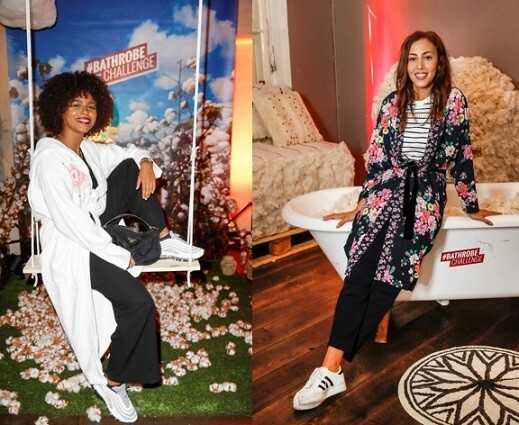 Celebrities – including CmiA ambassador and TV juror Motsi Mabuse, Revolverheld frontman Johannes Strate, singers Maite Kelly and Namika and actresses Marie Nasemann, Valentina Pahde and Minh-Khai Phan-Thi – already sported a bathrobe in 2017 for the first Bathrobe Day. Entrepreneur Dr. Michael Otto started up Cotton made in Africa (CmiA) in 2005 as an independent initiative. The supporting organization behind the CmiA is the Aid by Trade Foundation (ABTF) which is based in Hamburg. Today it is the largest initiative for sustainably produced cotton in Africa, linking African smallholder farmers, trading companies and fashion brands with each other along the worldwide textile supply chain. Instead of operating a donation policy, its aim is to help people to help themselves through trade in order to improve the living conditions of cotton farmers (currently over one million) and their families in sub-Saharan Africa and to protect the environment. The smallholder farmersenjoy the benefit of training courses and better working conditions, with projects enabling their children to go to school and female smallholder farmers particularly targeted for support with a view to boosting their professional and social independence.